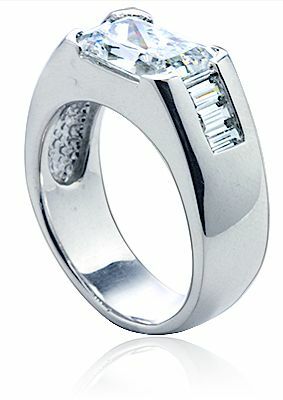 The Winchester Bezel Set Emerald Cut Cubic Zirconia Mens Baguette Ring features a 4 carat 10mm x 8mm semi bezel set cubic zirconia center, followed by three channel set baguettes on each side. The radiant emerald cut features 104 sparkling facets of the original Russian formula cubic zirconia that is hand cut and hand polished to exact diamond specifications. 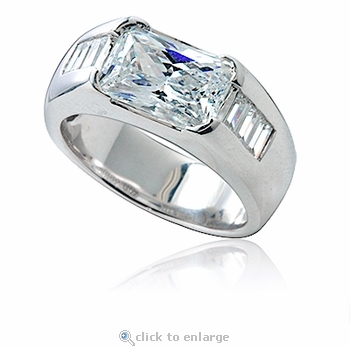 This semi bezel set and channel set men�s ring has the perfect combination of an emerald radiant cut cubic zirconia coupled with baguettes for a modern yet sophisticated look. 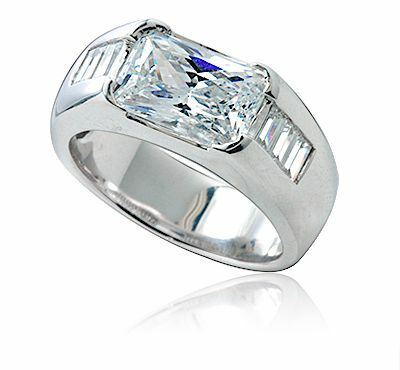 The shank measures approximately 8.5mm in width and the Winchester Emerald Cut and Baguette Men�s Ring a includes a total carat weight of approximately 4.75 carats. This clearance item is available in finger sizes 10, 10.5 or 11. For further assistance, please call us directly at 1-866-942-6663, option 2 or visit us via live chat and speak with a knowledgeable representative. This item is a clearance item. Due to extremely low pricing, all clearance sales are final.